And tonight’s Psalm will be.. Maggie’s Den.. number TEN! ( Another story, based on real experiences – Warning: it may contain many additives to preserve the quality for your enjoyment) ie it’s somewhat exagerrated – but could happen..! Think of the words “Choral Evensong” and a clear picture is built in your mind’s eye. A summer’s evening in a cathedral quire, the choir chanting impeccably in beatifully starched robes, the organ’s ethereal sounds wafting down from on high – effortless, serene, beautiful and dignified. Most of us have had experiences of that sublime act of worship, many of us have the privelige of trying to achieve it regularly in our churches, chapels and cathedrals, holding on to the value that it has as part of our rich cultural heritage. I have had many wonderful times taking a choir to sing Choral Evensong in a place that has never experienced one before. Often the church weren’t quite sure what to expect, but were alyays really grateful! In my student days, I travelled with a choir to an extremely remote church, which was a fair distance from any recognisable town, village, hamlet or even a house. On arrival, I was not surprised that the church had not had a choir for centuries, and it was a feat that they had managed any worshippers or indeed visitors at all! The vicar welcomed me and our singers like long-lost friends. He was a powerhouse of energy, and full of genuine, trembling excitement at the prospect of a visiting choir. Yes, I’m sorry, I made that last bit up, but this vicar was really determined to enjoy tonight’s show! He was sporting a delightful combination of a white frilly dress-shirt, huge bow-tie and white- jacket that cried out “Bingo-caller”. His introduction to the service, use of microphone and tone of voice, also called out “Bingo-caller”! 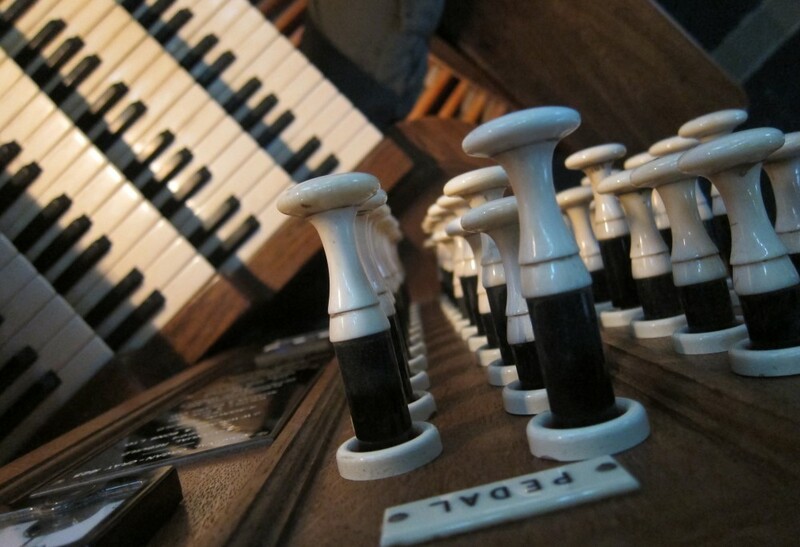 Organ plays: “Rhosymedre” – (or at least, a version of it without pedals, as befitted the one manual nightmare box described in previous blogs). Congregation respond with over-enthusiastic cheers, wolf-whistles, and tear-stained faces. (Amidst equally excited noises, from behind an old curtain comes a rather embarassed, apprehensive organ scholar, not used to facing an audience, about to be interviewed by Mr Showbiz himself..
“Tonight’s Psalm will be that old favourite… Maggies’ Den, number TEN! I’ve had an experience almost exactly like this..